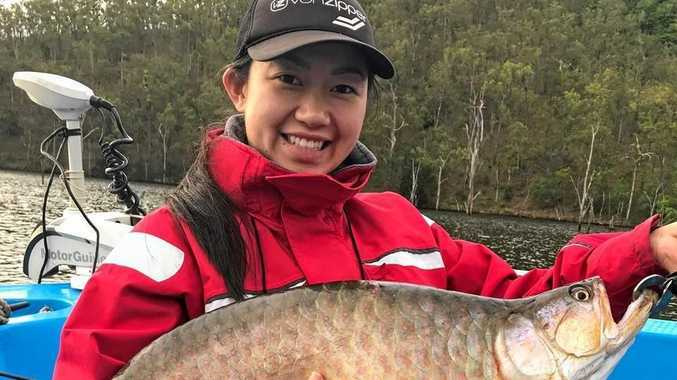 NORTH Pine Dam on Brisbane's north side has opened a new section of the dam to kayak anglers and the reports have been great. Bass and yellowbelly have been dominating the reports but there have been a few saratoga showing up as well. Cast and retrieving heavy spinnerbaits near the edge is a popular technique. Anglers are getting the larger bass a little deeper on the steeper banks hopping Jackall Tn60's or heavily weighted three inch Keitech plastics. A slow roll is all you need when the bass and yellowbelly are on the chew like they have been. Wivenhoe Dam is also producing the goods on the edges and a great place to take the kids. Trolling deep diving lures around the steeper banks and weed edges will see you hooked up to bass and yellowbelly. If you want to cast lures, focus on the same areas and cast soft vibes like the Jackall Mask 60 or bladed lures and slowly hop them back to the boat. Work the lure the whole way back to the boat as yellowbelly love to follow lures for a while before hitting them. Out in the bay, both school and spotted mackerel have been quite common off the beacons near Moreton Island and around Harry Atkinson Reef. Following birds and casting metal lures into busting up fish is fun and productive. However, trolling deep divers or metal spoons around reefs and beacons can work when the fish are a bit more timid. In the Southern Bay, the grassy sweetlip are on the chew around Peel Island and Goat Island early in the morning. Tides don't seem to play much of a roll with anglers catching their bags on either tide. Small soft plastics worked around the reef is a great method to catch these hard fighting fish. I'm sure you will encounter a huge range of bycatch using this method. If you want the chase them with bait, a long strip of squid is ideal as it will move around in the current and get their attention. Charlton's Fishing is at Redbank. Include your name, suburb, why your catch was so enjoyable and what equipment and bait or lure you used.